More non-fiction. 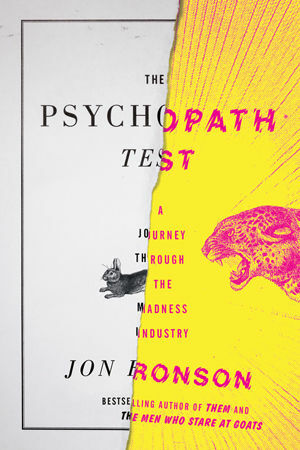 Ronson learns how psychologists look for signs of psychopathy, and begins evaluating everyone he meets. He goes out of his way to interact with people he thinks might be psychopaths: a CEO who shut down factories, insane asylum patients, a death-squad leader. I was too bored with the book to remember many more details. It claims to be “A journey through the madness industry,” but it felt more like the author wanted to show how everyone is poorly adjusted and a little crazy. And maybe more people should be institutionalized instead of in positions of power. The book has a 4-star rating on Amazon, and is one of the bestsellers for last year. I’m glad I just got the ebook from the library and didn’t contribute to that. If you want, read someone else’s review that nicely articulates how I felt about The Psychopath Test. Skip it! Any recommendations for more interesting mental-health-industry-themed books?